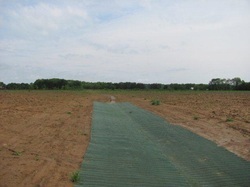 Recently, we have completed a silt entrapment pond on a local farm. A silt entrapment pond is a pond constructed to filter out silt before it enters the stream. This reduces the amount of dirt entering the stream greatly, and siltation is a major problem in Greene County streams. Additionally, we have designed and implemented grass lined waterways, cattle exclusion fencing projects, and many other siltation and runoff reduction projects on local farms. 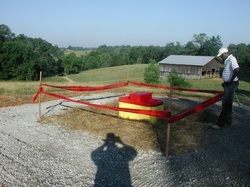 The siltation entrapment pond on a local farm. An alternate water source, constructed to restrict cattle accessing the creek while providing the livestock with clean water. 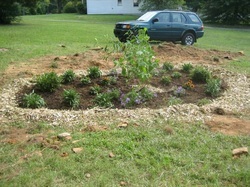 A very effective and inexpensive way to control stormwater runoff and filter pollution is by the construction of rain gardens. We have constructed several rain gardens in the area, and all have been cost effective and low maintenance ways of dealing with problems associated with stormwater runoff. A rain garden is a carefully designed garden that allows stormwater to infiltrate (soak into) the ground more effectively. By layering rocks and a special type of fabric, rainwater is absorbed into the soil and plants more effectively. 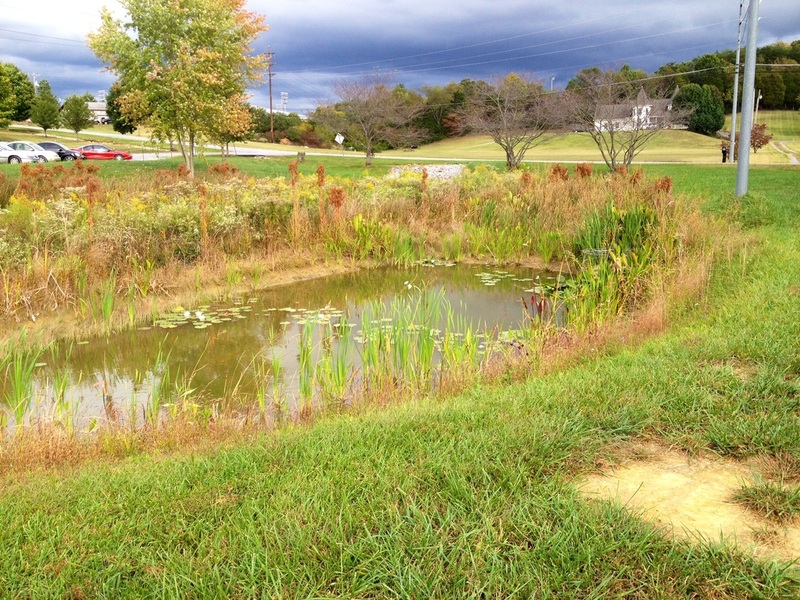 A retention/detention pond is designed to prevent flooding, control erosion, and improve water quality. Stormwater is typically piped into these ponds from parking lots, buildings, or other areas with large amounts of impervious surfaces. The difference between a retention pond and a detention pond is sublte, but makes a huge difference. A detention pond is called a "dry pond" because although it stores water after a storm, eventually the entire pond empties out. 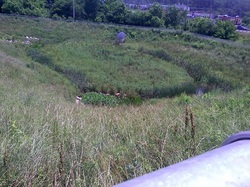 A retention pond collects the water and stays "wet" almost year round except for very dry seasons. We have successfully designed and implemented a detention pond for the Ingles parking lot in Greeneville to alleviate problems associated with downstream flooding in the College/Frank Creek watersheds. After installing this new pond, landowners downstream saw an immediate and marked change in their watershed, and a majority of flooding problems have been alleviated. Rain Barrels are an easy, low maintenance, cost effective way for an individual to help control stormwater runoff. 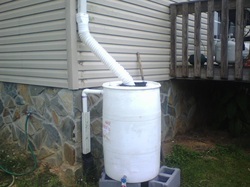 By connecting a barrel to the downspout on your home, rainwater is collected (or harvested) and can be used for a home garden, or watering your lawn. The Middle Nolichucky Watershed Alliance has held workshops on how to construct rain barrels, or can deliver and install a completed rain barrel to your home. For more information, or information regarding how to purchase parts or how to complete your own rain barrel, please contact us. The Middle Nolichucky Watershed Alliance, along with several volunteers, has constructed 3 wetland cells on the campus of Tusculum College. This wetland will function as a way to filter out pollutants commonly associated with stormwater runoff such as heavy metals, oils, fertilizers, pesticides, and litter. In addition to improving water quality, an outdoor classroom will be constructed in between the two larger wetlands to serve as an educational tool for students of all ages.